“Incora Imparo" - "I'm still learning"
Sandra brings a hands-on approach to her teaching. She offers multiple level classes as her goal is to meet the needs of her students. Sandra has over thirty years as an artist/educator. She enjoys working with others and sharing her skills and experiences. If you’ve even been curious about encaustic, you’re in for a treat! 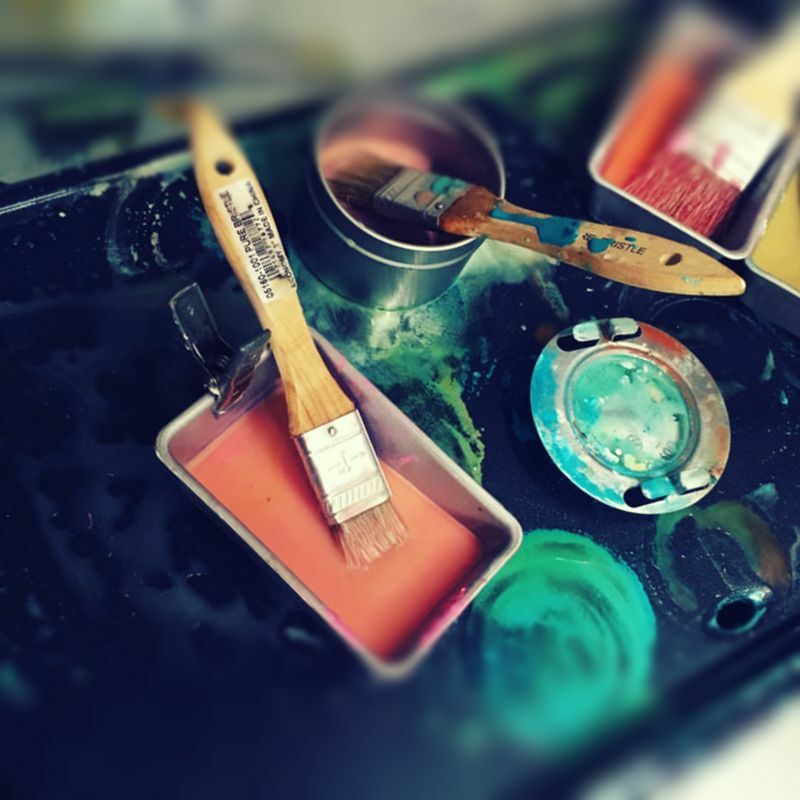 This workshop covers a brief history of encaustic, equipment needed, setting up your work-space, mixing colors, adding media and of course safety. Additional techniques will include collage, image transfer and combing oil with wax. Everything you need to start creating with encaustic. Hands-on work time will enable participants to create up to three panels. *Bring a water bottle, smock, notebook and ephemera you may want to experiment with embedding into the wax. Encaustic painting utilizes melted bees wax along with dammar resin and pigments in creating luminous paintings. Workshops available for beginner through advanced artists. All materials included. Pack a lunch and bring a water bottle, smock and notebook. BEGINNING ENCAUSTIC – If you’ve even been curious about encaustic, you’re in for a treat! This level workshop covers a brief history of encaustic, equipment needed, setting up your workspace, mixing colors, adding media and of course safety. Everything you need to start your own encaustic paintings. ADVANCED ENCAUSTIC – Take your work to a new level. This immersive course offers an experience with a solid base in techniques and best practices using wax. Additional techniques will explore include collage, printmaking, image transfer and combing oil with wax. Hands-on work time will enable participants to create three panels. ENCAUSTIC MONOTYPES – An exciting offering of wax on paper. Conversations will include pigments, wax crayons, papers, and additives such as India ink and graphite. Opacity and translucency working with pigment will be a focus. Mark making on and off the hot plate will be explored. LAYERING PHOTO IMAGERY WITH ENCAUSTIC – Develop skills and expand your vision working with wax and imagery. Explore various ways to incorporate various papers, mounting techniques and possible surfaces to consider. Additives such as dry pigments, oil sticks, oil paints, oil pastels and watercolor will be available to try for photo enhancement. Unlike some painting workshops, these classes focus on the process instead of the product. Participants will freely paint intuitively created imagery while learning various paint processes and mediums. Sessions will boost creativity, awaken inspiration, help let go of control and access inner wisdom. All materials included. Pack a lunch and bring a water bottle, smock and notebook. INTUITIVE PAINTING – Nurture your inner artist and follow your intuition to create. Chase your inklings, trust your inner muse and learn to stay present in your practice. Intuitive painting offers creative resurgence, which leads to the power of artistic expression. Geared for students who are ready to explore their inner artist. WHIMSICAL SELF PORTRAITS – Create lively, colorful, expressive self-portraits. Draw on creative intuition while discovering your imaginative self. Class is appropriate for all age levels. ACRYLIC BASICS – Foundation information will be covered including color theory, mixing, and glazing. Create imagery with plenty of room for individual interpretation. Enjoy one-on-one instruction as you learn to create in a nurturing art setting. MIXED MEDIA – Experience a wide variety of mixed media, layered imagery, use of textures and tools. Learn attributes of colors and mediums when creating an expressive layered painting. Substrates and adhesives will be part of the conversation. Experiment with washes, stains and collage while using stencils, paint, and pastels. All materials are included! Bring a smock, notebook and water bottle! Minimum of 6 students to run a class. Bring friends! Full tuition is expected when registering for workshops. Cancellations seven days prior to workshop will grant your refund minus $75 you can apply towards future workshop date. No refunds within seven days of workshop date. Workshops are offered in my Woodstown, NJ studio or can be arranged in your place of choice. Sandra is a certified K-12 Art Teacher. She also offers drawing and painting classes for children.